The monkey man or woman will not hesitate to accept a challenge. Any competition between these two might cause the horse’s restless nature to become apparent and they will move on, much to their partner’s surprise. The horse man or woman does not like staying in one place for too long as it is, so any provocation could push them to leave sooner than planned. The monkey will always want to go after their own pleasures first but they aren’t as erratic as the horse can be. Romance between these two Chinese astrology signs will certainly be a lot of fun and be full of energy. The problem is that they might not last very long. The monkey-horse compatibility in bed, too cannot be sexually satisfactory. The monkey probably will not have many issues with their lover. They are lively and outgoing and have a tendency to cheat on their partners. Horses like to jump into relationships headfirst. They enjoy the idea of being in love, but this does not stop their interest from changing. When they change their mind they are ready to break up the money-horse friendship and do not generally want to stick around to work things out. They are wanderers by nature and if they get the urge to move on early, their lover might not even have time to cheat on them. While the male or female horse is rational and takes advantage of opportunities, the monkey can be deceptive. The male or female monkey is adjustable and talented and might find the horse annoying because of their temperamental trait. These two will have a hard time understanding and tolerating each other’s differences. 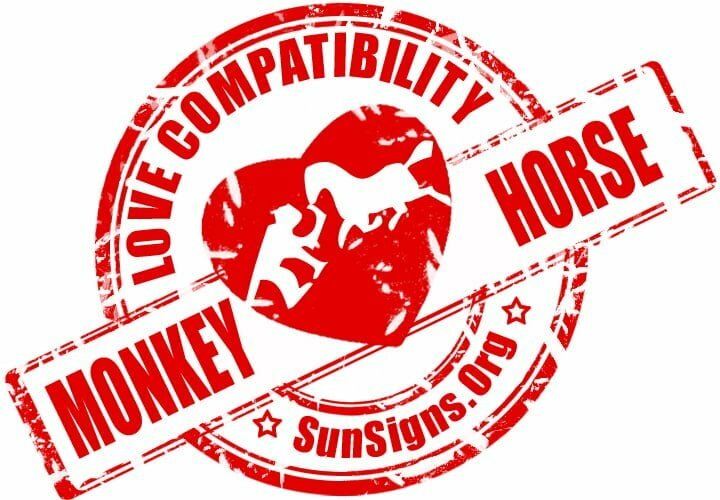 Monkey & Horse Chinese Horoscope Compatibility Rated 2 Hearts!